The HHT13 is a digital, battery powered portable optical pocket laser tachometer, which operates up to 7.5 m from a reflective target using a laser light source. The ergonomic design allows safe, direct line-of-sight viewing of both the target and the display at the same time, while providing a no-slip rubber surface for single hand operation. 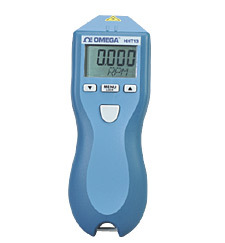 The HHT13 is a 32 function Tachometer/Ratemeter, Totaliser/Counter and Timer (stopwatch), which is programmable in both Imperial and Metric rates. Support is built-in for the optional Remote Contact Assembly (RCA) and the plug-in Remote Sensors. The HHT13 has a TTL compatible Pulse Output to trigger devices like data collectors or stroboscopes. Nota: HHT13 comes complete with traceable certificate of calibration, two 150 x 12 mm strips of reflective tape, two "AA" batteries and operator manual. The HHT13-KIT is supplied complete with operator's manual, traceable certificate of calibration, two “AA” batteries, 1.5 m roll of T-5 reflective tape, a remote contact assembly including concave and convex tips and a 10 cm linear speed wheel all in a latching hard cover carrying case.